Every day, you enjoy things you may not realize were made in Florida. Behind every product and technology you use, there is a world of manufacturing. Today, in Florida, more than 14,000 different companies and 355,000 people work in the manufacturing field. These employees are making, on average, over $48,000 a year. That’s over $23 per hour! This means not only jobs, but high-wage, high-tech manufacturing careers are being “Made in Florida” by people like you, right now. FLATE and its statewide networked partners are working together to plan for the biggest MFG DAY or MFG Month ever. You can contact your local or regional manufacturing association or FLATE directly if you have questions about how to participate. 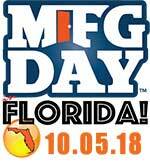 Below you will find resources and statewide news about FL MFG DAY/MONTH events; resources to help you plan events; upcoming events around the state (once reported) and how to get involved with FLATE’s “Made in Florida” Industry Tours on MFG DAY.